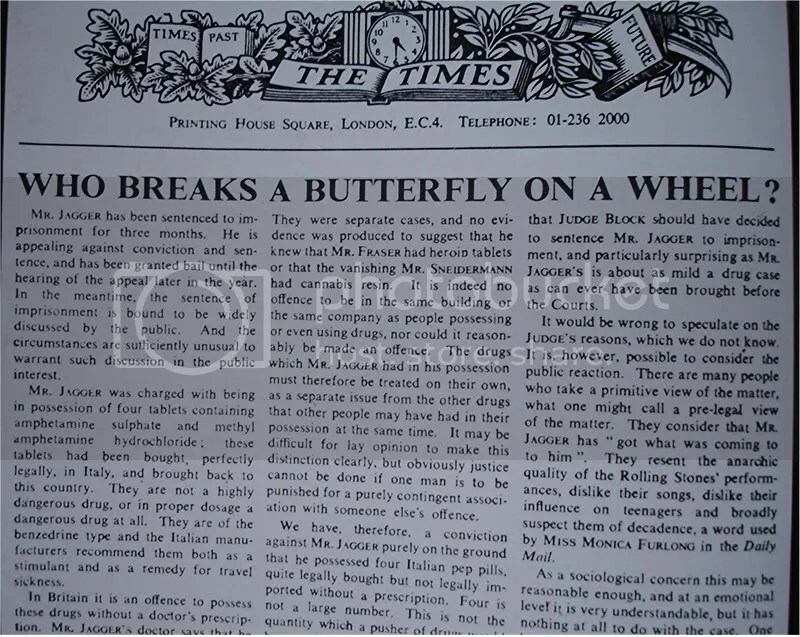 I’ve often thought that when William Rees-Mogg wrote his famous editorial in the wake of the Redlands court case, the butterfly was not so much Mick Jagger or Keith Richards but the third party in that sorry affair. Art dealer Robert Fraser was convicted alongside the Rolling Stones for possession, but while Richards and Jagger were spared prison partly thanks to the Times editorial, Fraser pleaded guilt and was sent to Wormwood Scrubs. It’s difficult now to think of Richards and Jagger as butterflies; Fraser was the one that got left behind to get broken. Some of letters and telegrams Fraser received and sent while during his four months at the Scrubs feature in the Pace Gallery’s superb exhibition, A Strong Sweet Smell Of Incense, which runs until 28th March. The title comes from Richard Hamilton’s collage, created as a response to the Redlands bust. It is displayed alongside one of Hamilton’s other famous creations in his Swingeing London series, which shows Fraser and Jagger being led away from court. Hamilton was one of several artists that Fraser promoted at his Duke Street gallery in the 1960s, and many of them feature in the show. 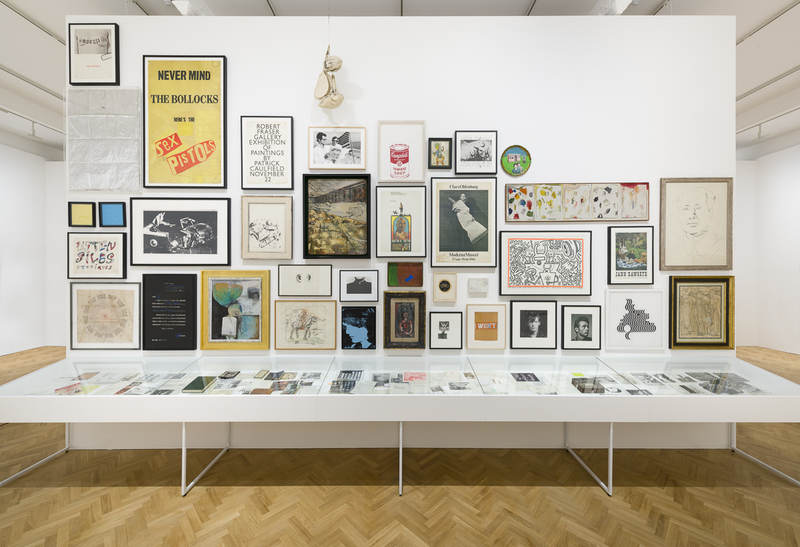 Here there are works by Andy Warhol, Jim Dine, Eduardo Paolozzi, Claes Oldenberg, Clive Barker, Gerhard Richter, Bridget Riley and Peter Blake, as well as later pieces by Francis Bacon, Keith Haring and Jean-Michel Basquiat. There’s also a nice mock up of Fraser’s office. Fraser had a great eye and a sense of daring, and that helped attract the stars. Fraser’s gallery became a centre for the cool kids of the counterculture, attracting pop stars, actors and film directors as well as perennially lurking scene figures like Keith Anger. 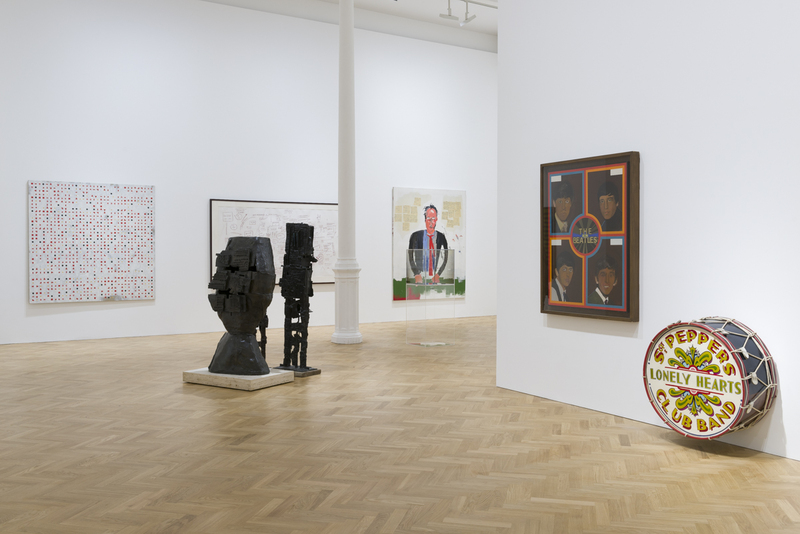 Paul McCartney described Fraser as “one of the most influential people in the London sixties scenes” and The Beatles feature in the exhibition, most wonderfully in the shape of the drumskin from Sgt Pepper’s Lonely Hearts Club Band, which Peter Blake created under Fraser’s direction. Fraser was the catalyst for much that happened in this mid-60s meeting of art and pop. 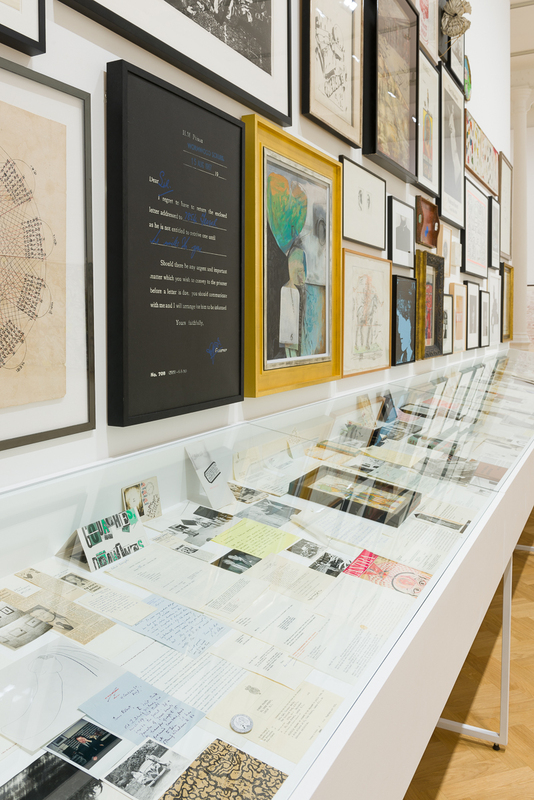 Fraser was nicknamed Groovy Bob and a sense of the fluid interchange of ideas that resulted from these encounters can be seen in a long display cabinet, arranged with artful haphazardness and crammed with personal letters, memos, books, flyers and photographs. There’s no caption for this wonderful ephemera, but rich pickings for those who take the time to drink it in. I was fascinated by a 1968 letter Fraser wrote to Richard Lock at Simon & Schuster proposing a biography of the Rolling Stones, which “would be satirical and totally fictional”. It was seen as a suitably Stonesy response to Hunter Davies’s recently published and “totally humourless” Beatles biography. Sadly, this came to nothing. The weeks that Pallenberg, with boyfriend Keith Richards, stayed at Fraser’s flat, would be pivotal to the unfolding psychosexual drama surrounding the Stones. 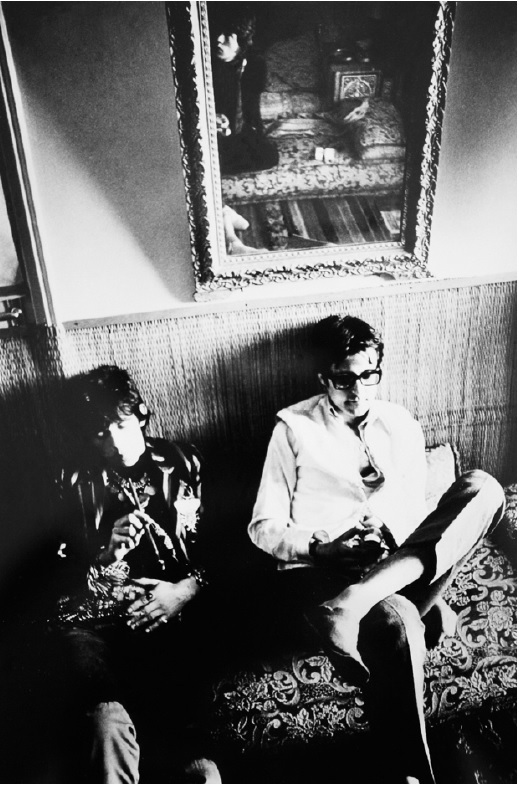 Fraser was using heroin (his opium pipe is on display), and soon turned on Keith, who was otherwise writing Let It Bleed and brooding about the shenanigans Pallenberg and Jagger were getting up to while making the film. The ensuing atmosphere of jealousy, betrayal spiced by heavy drug use would hang round the Stones for decades. As Richards spiteful autobiography shows, they still haven’t entirely gone away. Cecil Beaton photograph from Performance set. 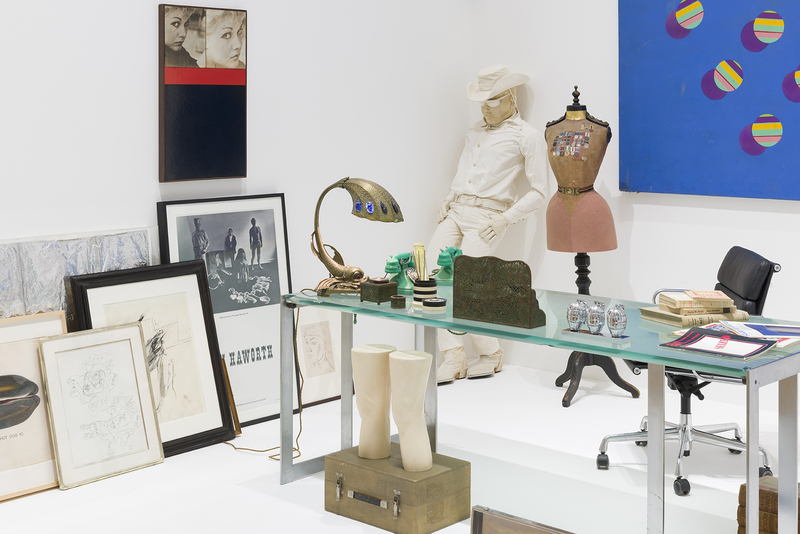 Also floating around the scene was another arch mischief-maker, Kenneth Anger, and a couple of his missives to Fraser can be found in the cabinet. Best of these is probably the telegram requesting £60 which concludes “GROOVING ON MAGIC CURRENT ONE TRILLION VOLTS AFTER AUSPICIOUS LUCIFER HOUSE BOAT LOVE IS THE LAW”. Indeed. But it’s the Stones with whom Fraser became most closely associated, for better or for worse. 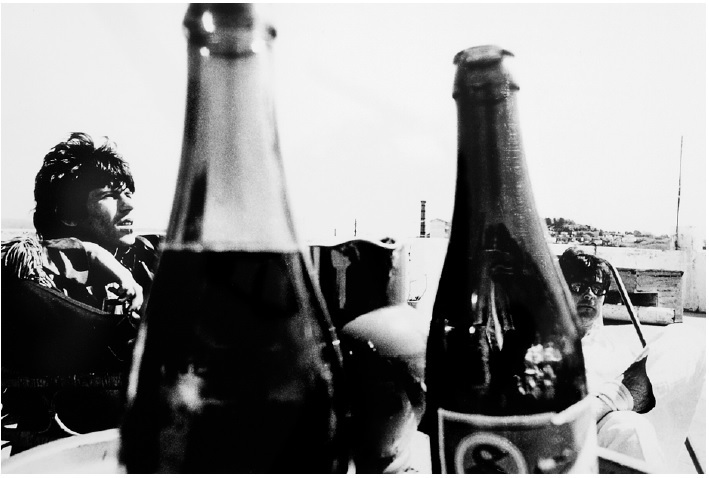 No matter how it ended, I’ve always loved a pair of photographs Michael Cooper took of the Stones with Fraser in 1966 and 1967 in Morocco, a location that is almost as emblematic of the 1960s as London itself, lingering even in the set design of that orgiastic lightning rod Performance. Here is the calm before the storm, before the butterfly is broken. A Strong Sweet Smell Of Incense at Pace London, 6 Burlington Gardens, W1S 3ET.